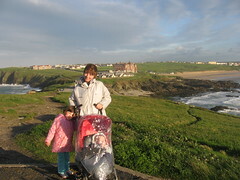 Spent a windy week in Newquay - I love surfing - but the rain and the cold proved too much for me - but not my four year old who was in the sea every day. Not quite a week. As we had to get back to Glasgow for the dancing display - my first as a dresser. Reminded me a bit of Little Miss Sunshine. Still trying to get glitter spray off my shoes . The fairies were having a great time.